Born of the rare and powerful Crescent bloodline, Fiona Mandrake is no ordinary witch. Because of her ability to divine the future, Fiona has visions of dark Fey who started a war between the realms that killed her parents. Fiona’s visions foretell the deaths of her coven and the destruction of the human world. But the war is not over. Through clues her mother left behind, Fiona discovers that the Council responsible for magic is corrupt and working with the dark Fey. She seeks the help of her coven and Sloane Blackwell, a Telepath who can see her visions and change her emotions with a single touch. They share a telepathic bond, one that brings them closer. Sloane’s unique abilities and his link to the Fey aid Fiona in her quest to end the war between the realms. But magic comes with a price. To save her town from destruction, Fiona and Sloane have to defy the Council, using magic that breaks an ancient law punishable by death. With the Council after them and dark Fey on the loose, Fiona and Sloane have to work together to extinguish the dark Fey before it’s too late. 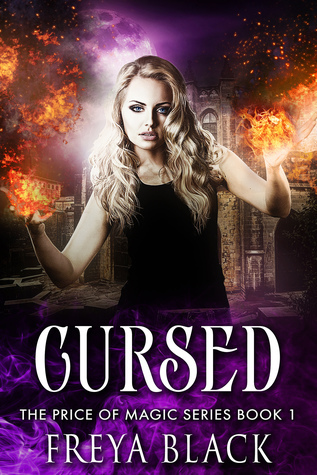 Cursed is the first book in The Price of Magic urban fantasy series. I delivered the drinks on my tray, leaving Sloane for last. In the middle of a heat wave, it was odd that he was wearing a long-sleeved shirt. Black cotton fit snug against his chest while the sleeves were rolled up to his elbows. He leaned over his book with a serious expression on his face, as if cramming for a midterm. Even the parade of girls in skimpy shorts couldn’t garner his attention. I wondered if supernatural creatures could feel human things, like hot and cold, happiness and despair. When I reached Sloane, I organized the cups on my tray to distribute the weight, attempting to steady my nerves, as the glasses clanged together. He looked up with a crooked smile, and I almost forgot to breathe. Even for a Hexenjager, he was charming. When he handed me his plate, our fingertips collided for a split second. His touch sent a tingling sensation throughout my entire body, similar to an electric shock. It rushed over me like breaking waves, pulling me under. No longer in control, I staggered back as the purple-and-gold damask wallpaper swirled together. Then, my legs buckled beneath me. Moonlight cast its shadow over the dark street. Lampposts and electrical wires fell with each explosion of thunder that pierced my eardrums. I turned my head, taking in the crumbling scenery and what was left of Pine Street. A sea of people darted toward me with crazed looks in their eyes. I stood in the middle of the street, paralyzed by fear. And that was when I saw them—monsters so terrifying that they could only exist in nightmares. As they moved forward, giant beams of light struck the asphalt in a methodical fashion, as if thrown from the sky by Thor and his mighty hammer. The pavement cracked in half and began to collapse under my feet. With the ferocity of a hurricane, wind plowed through the trees. A domino effect sent oak slamming into the concrete, wiping out rows of people in its wake. Jolted by the sheer force, I was about to plunge into the abyss when someone grabbed my hand. “Hang on, Nona,” the boy said. A boy the same age as me, no older than ten years old, squeezed my tiny bicep. Steely blue eyes peeked out from a chunk of black hair. He led me through the mayhem, calling out for our parents. No one answered. Droves of inhuman warriors charged forward, riding black horses. Viking helmets covered most of their faces. The parts of their gray skin not protected by armor were branded with tattoos that had a crimson glow shimmering in the darkness. Soulless pits, eyes like lumps of charcoal, glowered at us. They severed the heads from the bodies of those in their way, blood splattering everywhere, rolling off the red cloaks that flapped behind them. We dashed down Maple Drive, my heart thumping out of my chest, and we hid under a tree. Cocooned by its low-hanging branches, I failed to catch my breath until the boy wrapped his arms around me. My body stopped shaking, and my pulse returned to normal from his touch. I rested my head on his shoulder. The warmth of his energy circulated through my veins, meshing with my own powers, until the electricity pulsating between us consumed me. 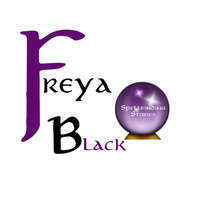 Freya Black is an emerging fantasy author who loves creating fictional characters and worlds. Her first book Cursed is the start of The Price of Magic Series with other young adult fantasy titles to follow.